Many residents of Eagle’s Trace have made achieving their fitness goals a year-long activity, empowered by on-campus resources and the ability to create an individual plan. Jim Hughes has lived at the Erickson Living retirement community in West Houston with his wife, Mauree, for more than two years. A member of the Health & Wellness Committee, he looked to begin a water aerobics program designed specifically for men. He crafted a proposal, discussed the idea with committee members and then promoted the project throughout the campus. “Water aerobics is such a great all-body workout. The water provides low-level resistance that makes the exercises even more effective in firming and toning muscles and improving cardio health,” stated Mr. Hughes who worked in the financial services industry in Texas prior to retirement. Under his guidance, the one-hour class is held three times per week in the indoor heated pool at Eagle’s Trace. 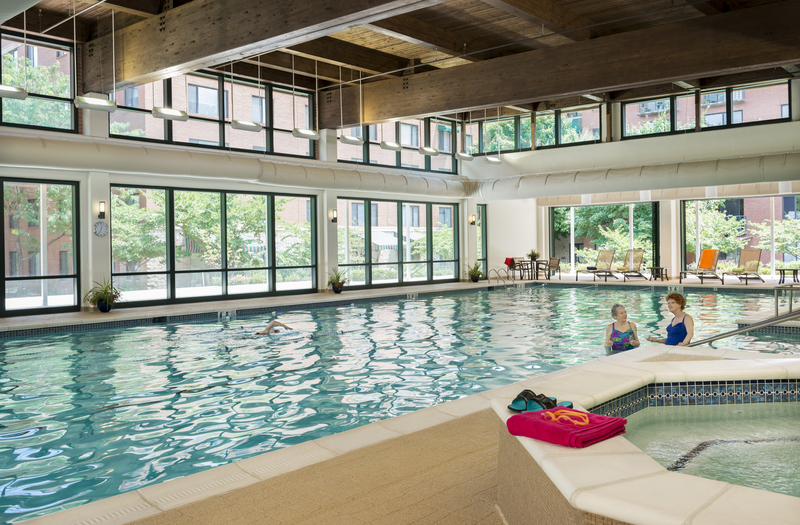 The water aerobics class is just one offering of a comprehensive program available to residents of Eagle’s Trace. They have complete access to a fitness center that is conveniently open 24/7, stocked with free weights, cardio machines and strength training equipment, and the aquatics center also provides a hot tub. Shirley Woods, Fitness Coordinator at Eagle’s Trace, oversees these offerings. Her job is to help residents achieve personal goals, in part by balancing expectations and reality. “Jim Hughes is a tremendous role model for us at Eagle’s Trace. Through his enthusiasm and organizational skills, he shows the many advantages for older adults to either have or begin a fitness routine. I’ve seen balance and overall demeanor improve quickly as well as better test results for blood pressure and cholesterol,” described Ms. Woods. A certified trainer with more than thirty years of experience, Ms. Woods teaches exercise classes that include Tai Chi, Pilates, yoga, water aerobics and the Ageless Grace program. It’s all part of the integrated health & wellness program at Eagle’s Trace that includes an on-site medical center. For those committed to a New Year’s resolution involving fitness, Ms. Woods recommends that her residents check with a physician. Once cleared, embracing a variety of activities and classes is a must.